Uniquely designed mixed media sculpture in an art deco style. 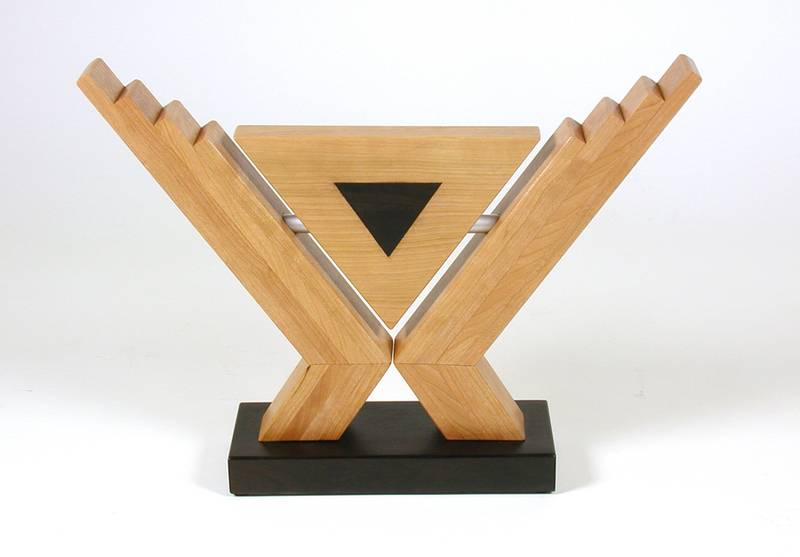 Angular cherry sides combine both stepped form and chevron design elements. The triangle shaped center has a blackwood inlay. This combination of art deco style elements symbolizes a cupping or holding in reverence of the center component. Metal serves to join the center piece to the sides. The base is solid blackwood. Surfaces are hand scraped and formed. Meticulous attention is provided to both detail and finishing. The wood is not stained and attains a natural patina over time and with exposure to ambient light. Finished with multiple coats of thinned shellac, polished and waxed.